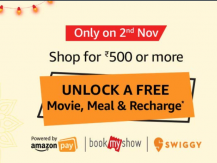 Amazon India has bring a great offer, Shop for Rs 500 or more and get a Free Movie, Meal or Recharge only on November 2, 2018 only best and lowest price online.You can follow the below steps to buy this product at their deal price.Keep Visiting dealsheaven.in for more Best offers ,hot online deals, promo code, free deals online,free samples, coupons and discount . Shop for INR 500 or more using any Electronic Payment method and get 100% cashback . Offer Valid only for Nov 2, 2018.